My goodness I have been neglecting my readers! I've been working like a crazy person getting the new models charted, stitched and finished for our next show in early March. If you subscribe to my monthly newsletter - you will be able to see Sneak Peeks of the newest releases! Each year the Just Cross Stitch magazine editor writes to designers to ask if we would submit something for their annual ornament issue. Sometimes I just can't figure out how to find the time, but this year I made myself chart and stitch the ornament in two days. A new record! I stitched it both over one and two threads, as I love the look of the tiny ones. I just received a new shipment of one of my favorite products - linen bags made in France. There are 3 sizes: an over the shoulder purse, as well as small and medium cosmetic bags. They really have so many uses: I store my device cords in one, and often travel with a stitching project in the larger model. They can be monogrammed with initials on the top cuff. Sometimes the smallest gift can be the most meaningful. My granddaughter Elli made a card for me for my birthday - and here is what she wrote: Happy Birthday Nana! One day I want to stitch with you, please. Oh my - that has to be on the top of my list this week! And then the cutest part - across the top she wrote: These are stitching ideas. She had colored 6 little designs - which were exactly what an 8 year old would like to stitch: hearts, balloons and flowers. We all hope that someone in our family will get the same pleasure and sense of calm that we do from stitching, and I think I have the next heir to my company! Wishing you a wonderful month of projects, and maybe even some completions! 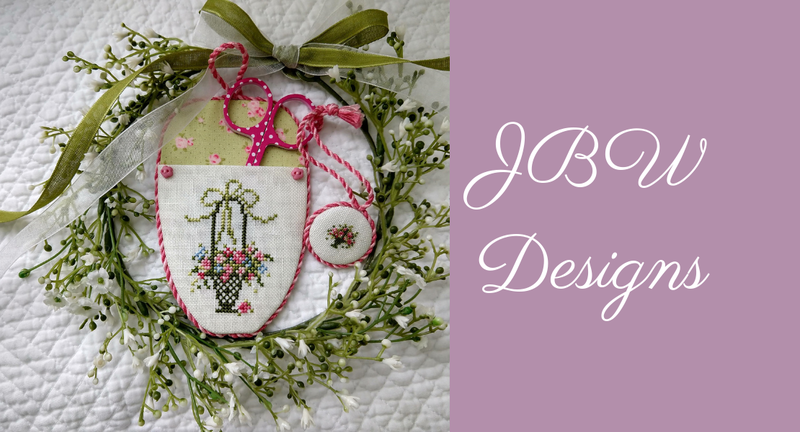 Be sure to post your finished designs on our Friends of JBW Designs Facebook page, as we receive great suggestions and love to share them with you. I read your article too briefly you are providing great service related to embroidery digitizing. Good Work!